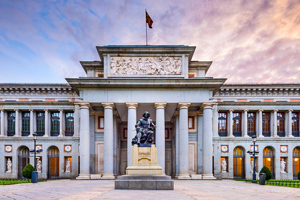 All lovers of the arts and beautiful items from the past will be well rewarded when visiting the Prado Museum which, according to National Geographic, is one of the 10 best museums in the world. Visiting the museum with the option to "skip the queue" will save precious time and will enable you to enjoy this unique experience to the full. Entry tickets permit access to exhibitions which are constantly changing, amongst which are several works by the Spanish masters, Goya and Velázquez, that are united in this spectacular setting. Purchasing your tickets in advance is strongly recommended. The Prado Museum is located inside a wonderful old castle which houses in its interior thousands of works of art, each one more fascinating than the previous. From the great Spanish, Belgian, German, Italian and Dutch Masters, the Prado has put together one of the largest and most beautiful collections of European art in the world. SPANISH PAINTING: undoubtedly Spanish art is the best represented with the collection covering works of art from the XII to the XIX centuries. On the first floor, works by El Greco, Ribera, Murillo, Velázquez and many other artists from the Golden Age are on view whereas works by the famous Goya are spread across three floors of the Museum building. FLAMENCO PAINTING: the artworks that are exhibited in this section are comprised of collections that cover the period from the XV to the XVII centuries. You can admire flamenco works by van der Weyden, Bosch, Patinir and Pieter Bruegel on the musuem's lower floor whilst paintings by Jan Brueghel, Rubens, Van Dyck and Jordaens are located on the second floor. ITALIAN PAINTING: Italian art is also well represented with works from the early Renaissance, you will discover works by Fra Angelico, Mantegna and Botticelli here, whereas the XVIIII works include those by Tiepolo. You also cannot afford to miss out on the masterpieces by Rafael, Titian, Tintoretto, Veronese and Bassano which constitutes one of the most compact groups of paintings inside the Prado (on the lower floor). On the first floor you will find works by Caravaggio and Gentileschi. The Prado also has an area of the museum which is dedicated to GERMAN PAINTING (a limited number of items but all of extremely good quality) and an area that is dedicated to DUTCH PAINTINGS. In addition to these, there is also a wonderful collection of SCULPTURES. The latter is made up of more than two hundred and fifty works which are distributed throughout the galleries to be admired by the hundreds of visitors who come from every corner of the world on a daily basis. On the day of your visit, just show the entry tickets on your smartphone at the main entrance to the Prado. The Prado is open every day except on certain public holidays.